As Ivan Basso and Team CSC raced into Milan on May 28th to capture the overall victory at this year's Giro d'Italia, many race fans and members of the media took notice that the team was riding special pink Zero Pedals that matched the race winner's pink jersey. To commemorate Speedplay's first Giro d'Italia victory, Speedplay produced its Zero Pedal System in pink for Ivan Basso and the entire CSC team to ride for the final stage into Milan. 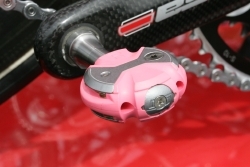 Team CSC's eye-catching pink Zero Pedals prompted numerous calls and emails to Speedplay's headquarters in San Diego seeking information on the availability of the pink Zeros. said Speedplay president Sharon Worman. "But the interest in the pink pedals has been so strong that we will now make them available for sale." Production quantities will be limited and pricing has not been finalized, but pink Zero Pedals are now in the works and are set to arrive at Speedplay retailers this summer. Since the start of the 2006 racing season, riders using Speedplay's Zero Pedal System have won such major races as Paris-Nice, Critérium International, Paris-Roubaix, the Amstel Gold Race, the Tour of California, and the Tour de Georgia. Speedplay Zero pedals have also helped propel Team CSC to the top of the UCI Pro Tour rankings. Team CSC chooses Speedplay Zero Pedals because they offer advantages that other pedals just can't match, including the lightest weight of any pedal in the peloton at 82 grams each. Zero Pedals also offer no-look dual-sided entry; up to 15 degrees of micro-adjustable non-centering float; unbeatable cornering clearance; a large, stable platform; a true locking mechanism; and a slim aerodynamic profile for the lowest stack height available. Speedplay designs and manufactures user-friendly, high performance pedal systems for road and off-road cyclists. For more information about Speedplay pedals call 858/453.4704 or visit Speedplay.com.